To write a simple PHP page. The difference between single and double quotes. 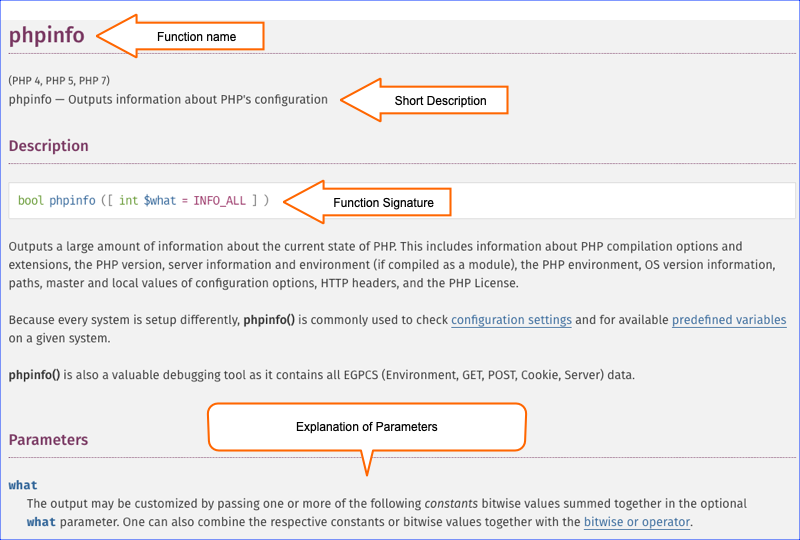 To recognize and look up documentation on PHP functions. To understand and work with simple PHP variables. To include files in other files to avoid rewriting the same content. To display error messages during development. 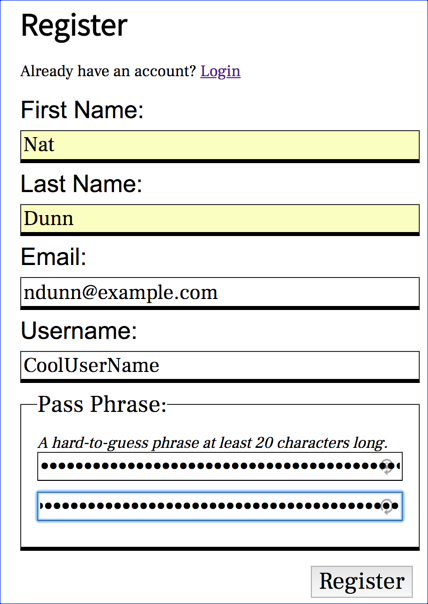 If you have already taken our Creating, Styling, and Validating Web Forms course, the rest of the content in this reading will be familiar to you. You are welcome to review it or skip ahead to the next activity. Perform a database search and return a list of search results. 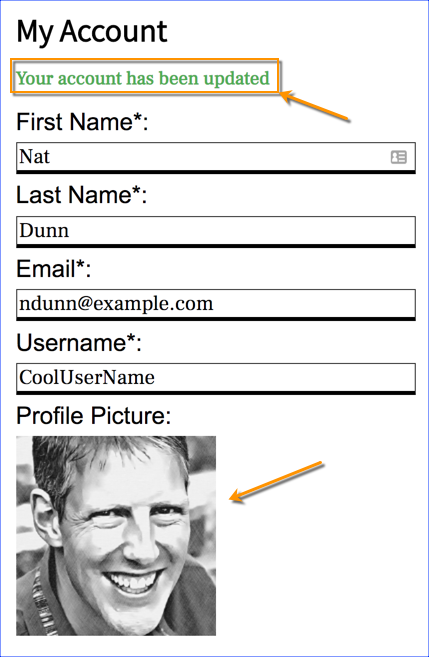 Log a user into a website by checking the database for the user's credentials. Redirect the user to a login page if the user requests a members-only page. Record a user's support request in a database, email the user a friendly "we-will-be-in-touch-soon" message and the auto-generated support ticket number, email the support team letting them know a new request has come in, and return a dynamically created HTML page with a friendly "we-will-be-in-touch-soon" message and the auto-generated support ticket number. Click on the three-vertical-dot icon in the upper right of Google Chrome. Now reload the page and look at the Network tab: This shows what documents were delivered to the browser, their status, what type of documents they were, and what initiated the delivery. Here are the same static files delivered from a web server. We will look further at how this was delivered soon: The only difference is the Status column. The web server sends back a status code to let the client know the status of the file. The 200 status code means that everything is fine. 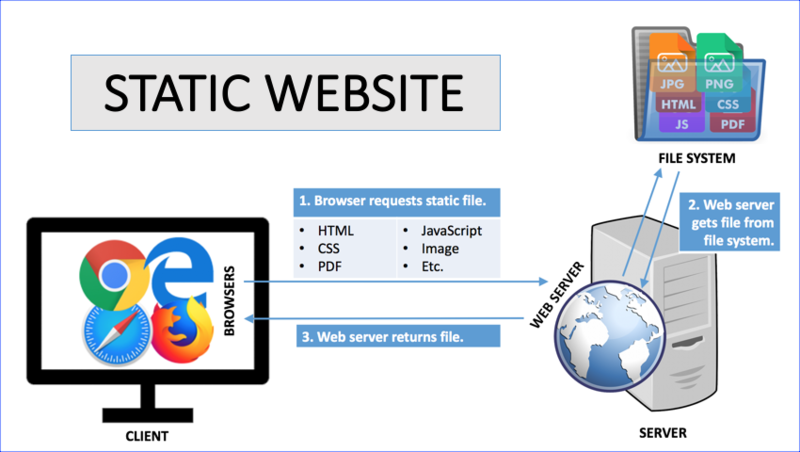 The 304 status code means that the file hasn't been modified since the last time it was requested, so the browser can use the version it has in cache if it has one. 301 Moved Permanently. The file used to be at this URL, but it isn't anymore. 304 Not Modified. The file hasn't changed from the last time it was sent to the client. 400 Bad Request. Something about the way the request was made has baffled the web server. 401 Unauthorized. You have to be logged in to access this file. 403 Forbidden. You can't have this even if you are logged in. 404 Not Found. There is no file here. 500 Internal Server Error. Something went wrong on the server. 503 Service Unavailable. The web server is down or overloaded. As the server-side developer, you have the ability to return these status codes and to decide what pages get returned with them. 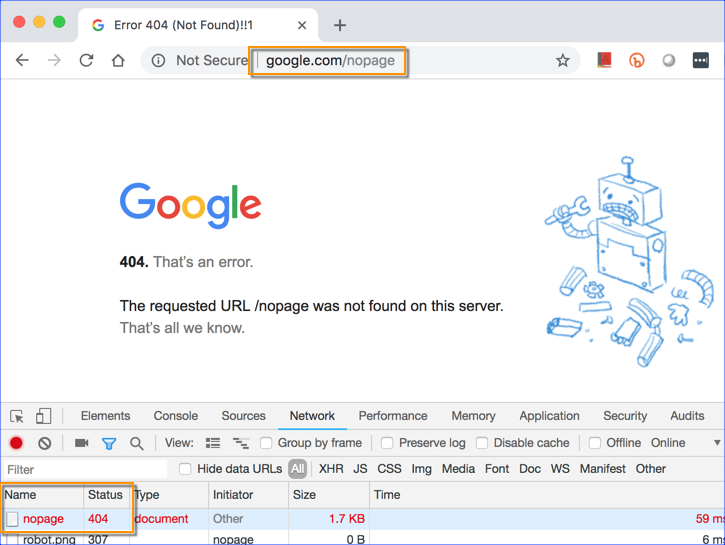 For example, it is common to return a special "404 Page Not Found" page when the user navigates to a URL on your website that doesn't exist. The screenshot below shows how Google handles this: Notice the 404 status on the Network tab. When a user browses to a page that ends with a .php extension, the request is sent to a web server, which directs the request to the PHP interpreter. 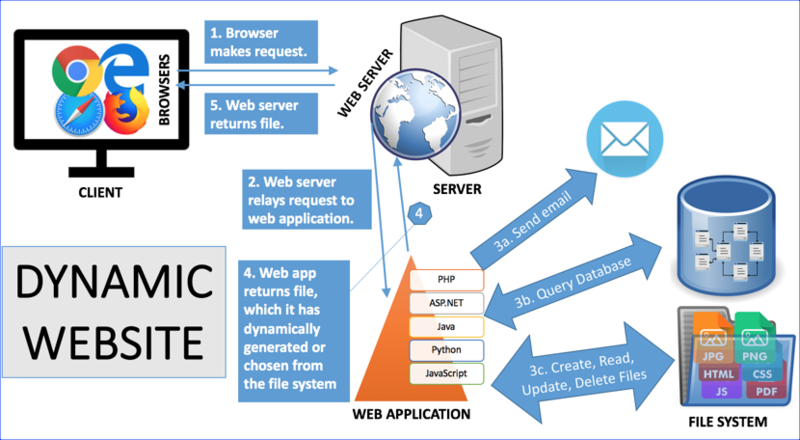 The PHP interpreter processes the page, communicating with file systems, databases, and email servers as necessary, and then delivers a web page to the web server to return to the browser. Before we look at PHP syntax, we should briefly mention the php.ini file. This is a plain text file that is used to configure PHP. When the PHP interpreter is started, it reads the php.ini file to determine what settings to use. We will mention this file from time to time throughout the course, but for now, it is enough that you are aware of its existence. // Write out Hello World! Code between <?php and ?> is processed by the PHP interpreter. The echo command is used to print text back to the browser. This code isn't very exciting. In fact, PHP doesn't buy us anything here as we could have just as easily output the result using straight HTML. There is nothing dynamic about this script. After learning about variables, we'll take a look at some more interesting examples. 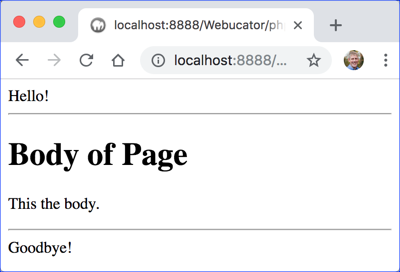 In this course, we assume that you are using port 8888 to serve your PHP pages. We also assume that your class files are located in htdocs/Webucator/php/. If you're using a different port or your file structure is different from this, you will need to modify the localhost URLs accordingly. PHP statements must be inside of PHP tags to be processed by the PHP interpreter. Each PHP statement must end with a semi-colon, which tells the PHP interpreter that the statement is complete. If a semi-colon does not appear at the end of a line, the interpreter will assume that the statement continues onto the next line. The PHP interpreter condenses all sequential whitespace in PHP scripts to a single whitespace. This convenient feature allows PHP developers to structure their code in a readable format without being concerned about the effects of line breaks and tabs. required parameters: Any required parameters must be listed first. The php_info() function doesn't have any required parameters. optional parameters: Any optional parameters must be listed after the required parameters. In the signature, optional parameters appear in square brackets and must have default values. The $what parameter of phpinfo() is optional and has the default value of INFO_ALL, which is a constant (to be covered soon). The function returns a string. The $format parameter is required and must be a string. The $timestamp parameter is optional and defaults to the value returned by the build-in time() function, which you will explore in the following exercise. The epoch is the moment that a computer or computer language considers time to have started. PHP considers the epoch to be January 1, 1970 at midnight (1970-01-01 00:00:00). Times before the epoch are expressed internally as negative numbers. Pay attention to the function signature and the parameter descriptions. You may also find it interesting to read some of the user-contributed comments. Those can sometimes be very useful. Create a new PHP file and experiment with the functions. Variables are used to hold data in memory. Variable, function and class names are all identifiers and all follow these rules, with the exception that function names are not case sensitive, though the best practice is to treat function names as if they were. See PhpBasics/Demos/gettype.php, which uses the gettype() function to show the current type of $a after each cast. Then run the file by visiting http://localhost:8888/Webucator/php/PHPBasics/Demos/gettype.php. 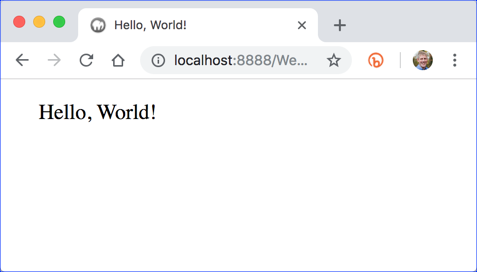 This time the string "Hello, World!" is stored in the $greeting variable, which is output in the title and body of the page with an echo command. In this exercise, you will write a simple PHP script from scratch. The script will declare a variable called $today that stores the day of the week and outputs it to the page in the title and the body. Open a new document and save it as today.php in the PhpBasics/Exercises folder. Declare a variable called $today that holds the current day of the week as literal text. Output $today in the title and body of the page. 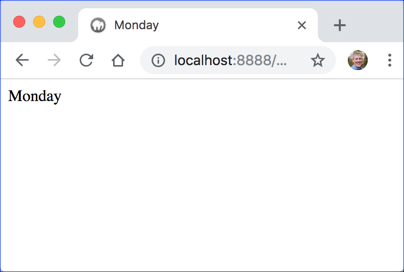 Instead of assigning a literal string (e.g, "Monday") to $today, use the built-in date() function so that the script won't have to be manually updated every day to stay current. For documentation, visit https://www.php.net/date. A variable's scope determines the locations from which the variable can be accessed. PHP variables are either superglobal, global, or local. superglobal Superglobal variables, also called automatic globals, are predefined arrays, including $_POST and $_GET. They are accessible everywhere. global Global variables are accessible throughout the script in which they are declared and any files that are included by that script. However, they are not visible within functions in the script unless they are re-declared within the function as global variables. local Variables in the function scope are called local variables. Local variables are local to the function in which they are declared. $_GET - variables passed into a page on the query string. $_POST - variables passed into a page through a form using the post method. $_SERVER - server environment variables (e.g, $_SERVER['HTTP_REFERER'] returns the URL of the referring page). $_FILES - variables containing information about uploaded files. 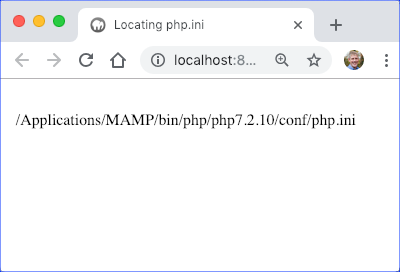 $_ENV - PHP environment variables (e.g, $_ENV['HTTP_HOST'] returns the name of the host server. 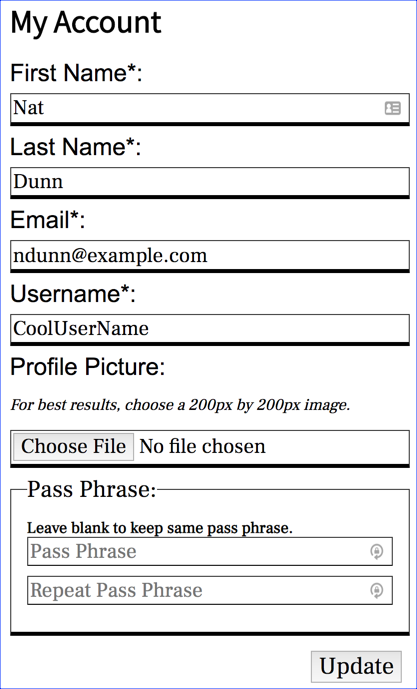 $_REQUEST - variables passed into a page through forms, the query string and cookies. We will revisit superglobals throughout the course. // a more convenient name. Notice the following about the code above. Variable names begin with a dollar sign ($). Values passed in the query string are part of the $_GET array and can be accessed using the following syntax: $_GET['var-name']. We use double quotes so that the variable is evaluated and not output literally. 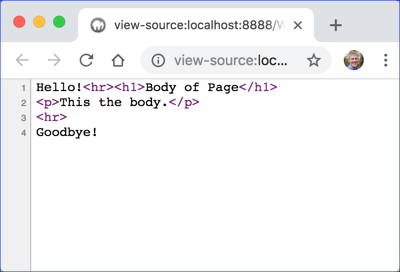 In this exercise, you will write a script that says "hello" to different people based on what is passed through the query string. 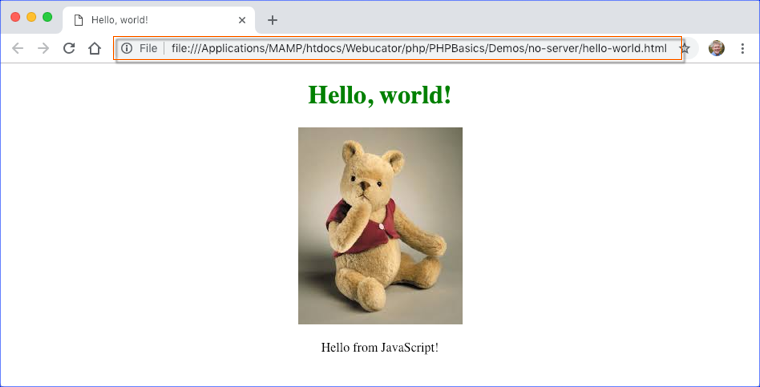 Open PhpBasics/Exercises/hello-who.html in your editor. You will see that it is the same as the demo we looked at earlier. 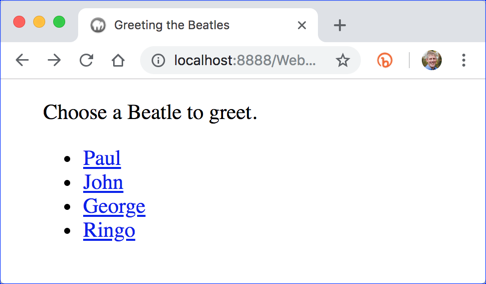 Modify hello-who.html so that it has four links, each of which passes the name of one of the Beatles (Paul, John, George, and Ringo) to hello-who.php, which is in the same directory. 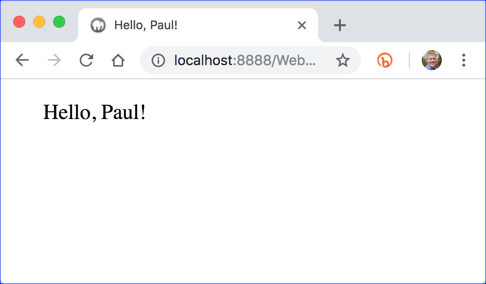 Open PhpBasics/Exercises/hello-who.php in your editor. Modify the code so that it outputs a greeting based on the link clicked on hello-who.html. Change the links so that each Beatle gets a custom greeting (e.g, 'Howdy, Paul! ', 'Hi, John! ', 'Bye, George! ', 'Hey, Ringo!'). User-defined functions (UDFs) are used to make common tasks easier and to make code more modular and easier to read. Note that calling addNums() without passing in the correct number of values will result in a fatal error. You can fix this by providing default values. In this case, if you don't pass a value into the function for one or more of the parameters, the default value of 0 will be used. When defining a function, all required parameters must precede optional parameters. As $a is not available within incrNumBy(), a warning is generated, which depending on your settings (more on this soon) may or may not be output to the browser: Notice that the function doesn't take into account the value of $a and returns only the value passed in as $incr: 5. This time the call to incrNumBy() will output 15 as expected. This time the function outputs "15" because $num references the variable $a itself. So, any change in $num will affect $a. 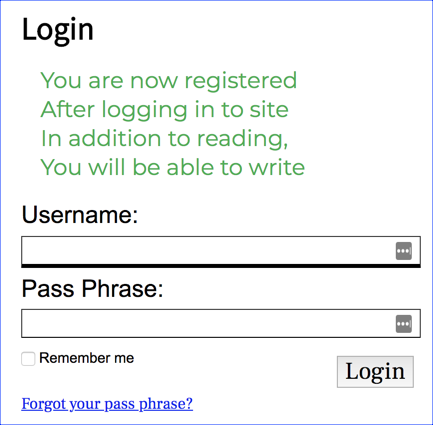 User authentication - anyone can read poems, but you must be logged in to submit your own. 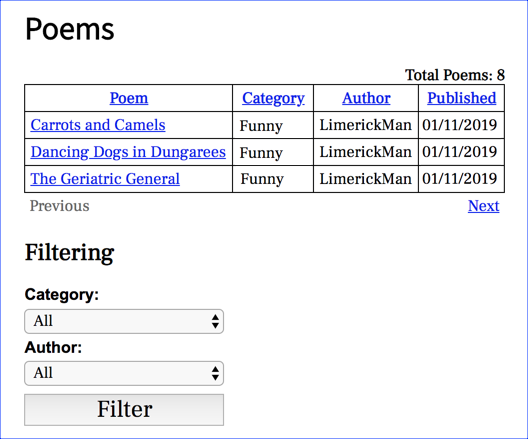 Poem browsing, including filtering and pagination. Administration area for approving poems and viewing user data. 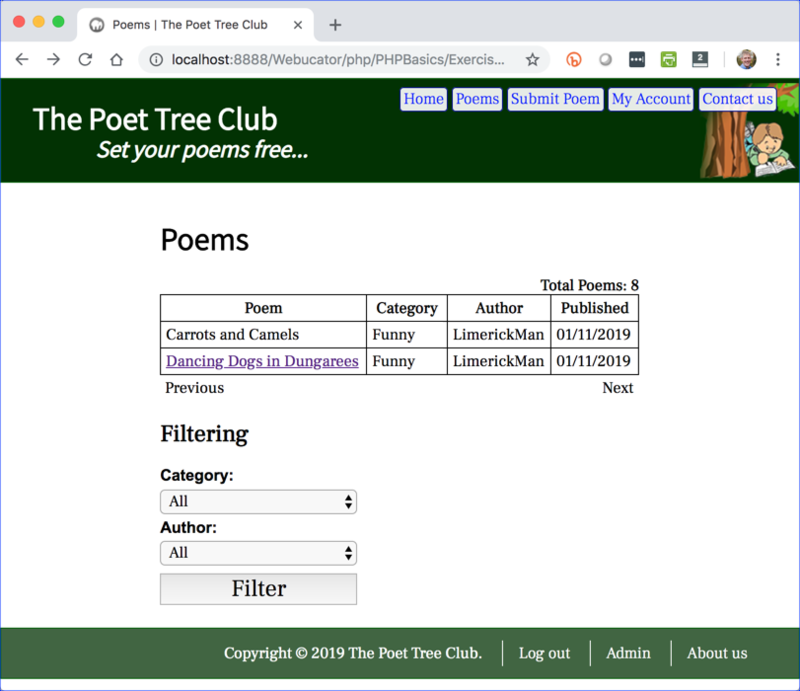 Note that we are currently only showing three poems per page, but you will learn how to configure this to show any number. Click the Next and Previous links to page through the poems. 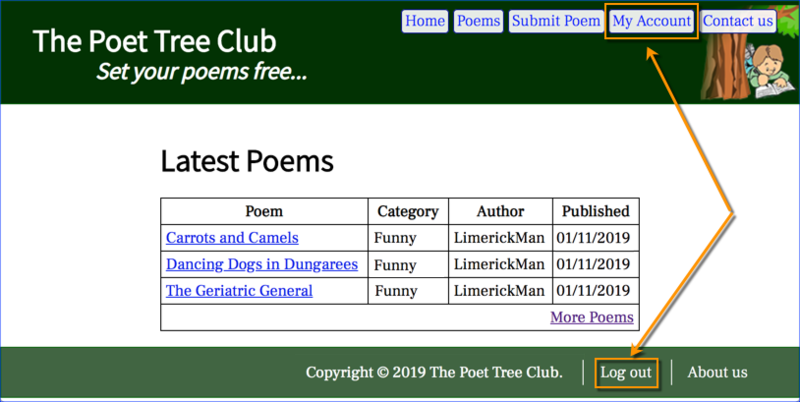 Click on the table headers to sort the poems. 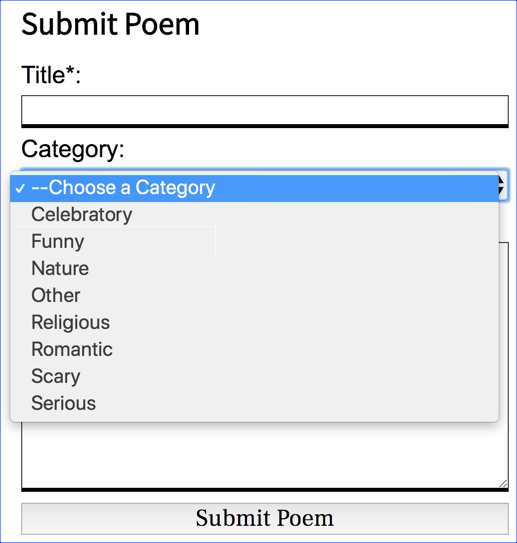 Filter the poems by category and author. If you submit an invalid form, you will get errors. If you submit a valid form, you will get a success message telling you to check your email: Note that you will have to confirm your registration before you can log in. This is to prevent other people from registering you for the site. Click on the click here link. 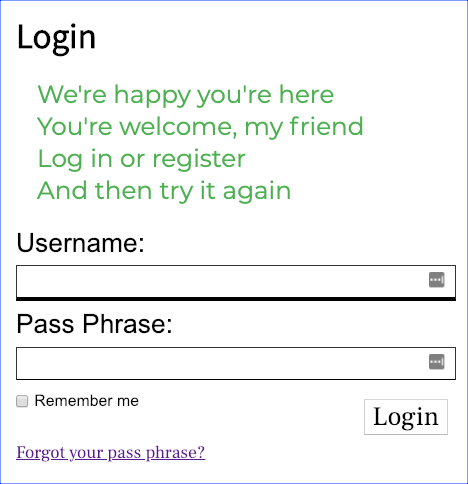 That will take you to a login page: Note that when you go to this same page in the future, it won't show the "You are now registered" poem. The login.php page knows that you have arrived by clicking on the link in the email. Log in with your username and password. If you check the Remember Me checkbox, you will not have to log in the next time you visit. On a successful login, you will see the home page again: The site knows you are logged in. Notice that the menus have changed. There is now a My Account link in place of the Login / Register link in the top navigation and there is a new Log out link in the footer. 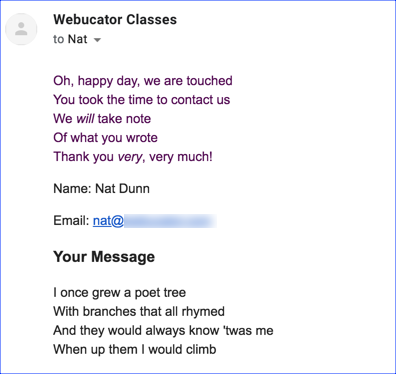 Because you wrote the poem, you get Edit and Delete buttons. If you click the Delete button, you will get a confirmation page: Delete the poem if you like. You will get a page letting you know it was deleted. Press the Choose File button below the Profile Picture heading and select a profile picture (a png or jpg) from your computer to upload. Then press the Update button. 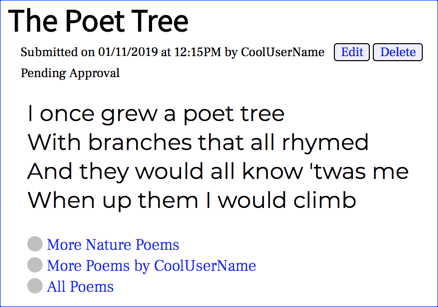 Admins can edit, delete, and approve and unapprove poems. They can also update users and make other users administrators. 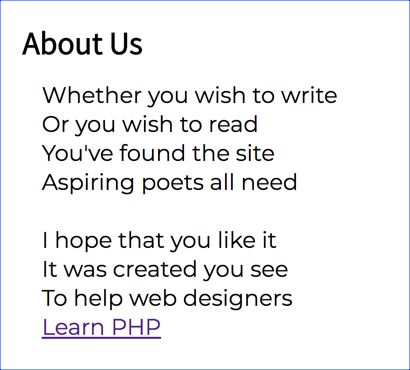 Throughout this course, you will learn to build this "PHP Poetry" site. Most websites, including PHP Poetry, have a header and footer that are common to many pages. Rather than rewrite the header and footer with every new page, wouldn't it be nice if you could just write them once and include them on multiple pages on the site? Enter PHP. PHP provides two common constructs for including files in web pages: require and include. They are basically the same with one minor difference: require throws a fatal error when it fails; whereas, include only gives a warning. If the included file is necessary (i.e., required) to continue to process the page, you should use require. It is important to keep in mind that a PHP tag cannot start in a calling file and continue in an included file. All PHP code in the included file must be nested in PHP tags. path_to_file can be an absolute or a relative path. require_once can be used just like require. The difference is that if the included file has already been included by earlier code, it will not be re-included. The above code is relatively straightforward. include-demo.php contains two included (required) files: header.php and footer.php, both of which are in the includes folder. Note that this demo is intentionally kept very simple. Normally, you would create a complete HTML page starting with the open <html> tag and ending with the close </html> tag. In this exercise, you will start with a full HTML page and break out the reusable parts into include files. Notice that the top and bottom of these three pages are identical. Notice that, except for the titles, they begin and end with identical code. Create a new folder called includes in the Exercises/phppoetry.com folder. For header.php, include all content from the beginning of the file to the close </header> tag. For footer.php, include all content from the open <footer> tag to the end of the file. 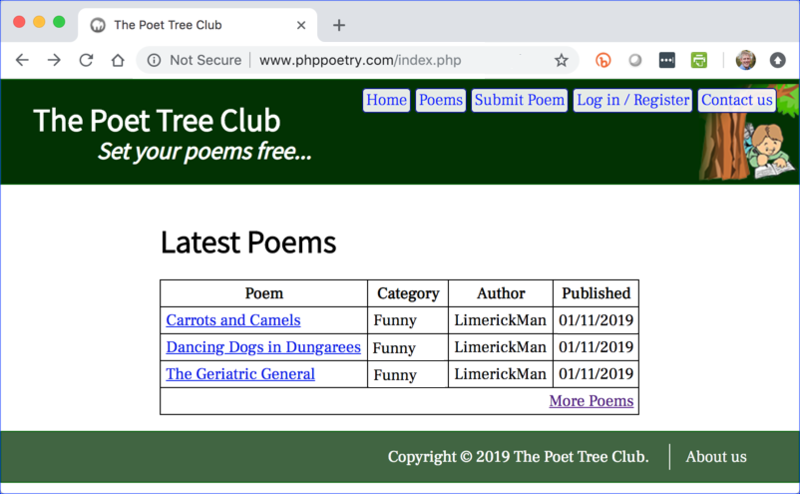 Replace the common beginning and ending code in index.php, poems.php, and poem.php with PHP code to include the new header.php and footer.php files. 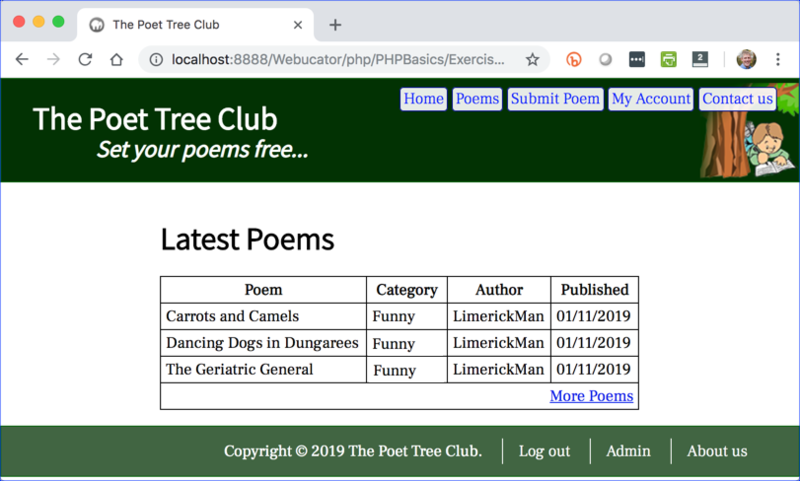 Navigate to http://localhost:8888/Webucator/php/PHPBasics/Exercises/phppoetry.com and then visit the poems and poem pages to test your solution. They should look exactly as they did before with one exception: they will all now share the same title. 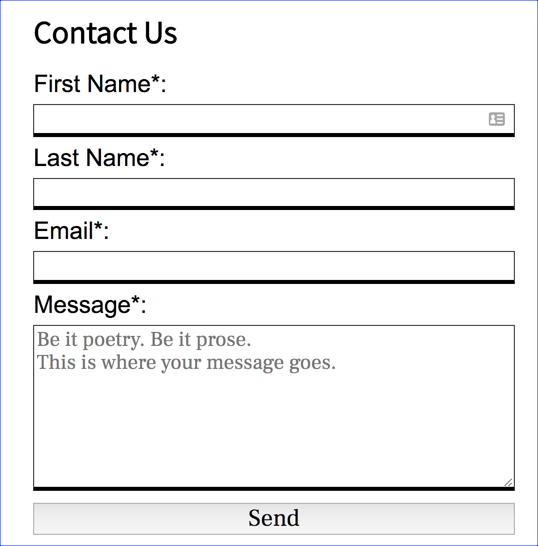 Add PHP code to the beginning of poems.php that sets a variable named $pageTitle to 'Poems'. 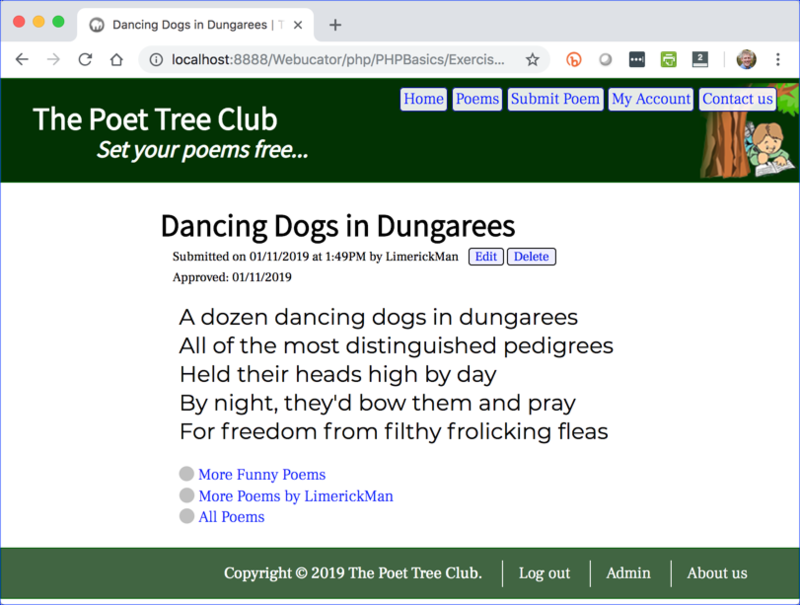 Add PHP code to the beginning of poem.php that sets a variable named $pageTitle to 'Dancing Dogs in Dungarees'. But we don't declare a $pageTitle variable in index.php, so nothing gets output. In fact, this generates a low-level error in PHP called a warning. Normally, warnings are simply ignored, but you can change this as we will soon see. Constants are like variables except that, once assigned a value, they cannot be changed. Constants are created using the define() function and by convention (but not by rule) are in all uppercase letters. Constants can be accessed from anywhere on the page. PHP_VERSION - The version of PHP that you are running. DEFAULT_INCLUDE_PATH - The path to the directory in which PHP will look for included files after it looks in the current directory. More on this soon. E_ERROR: Report fatal run-time errors - errors that will stop execution of the script. E_WARNING: Report run-time warnings - errors that will not stop the execution of the script. E_DEPRECATED: Report notices about deprecated code- code that may not work in future versions of PHP. 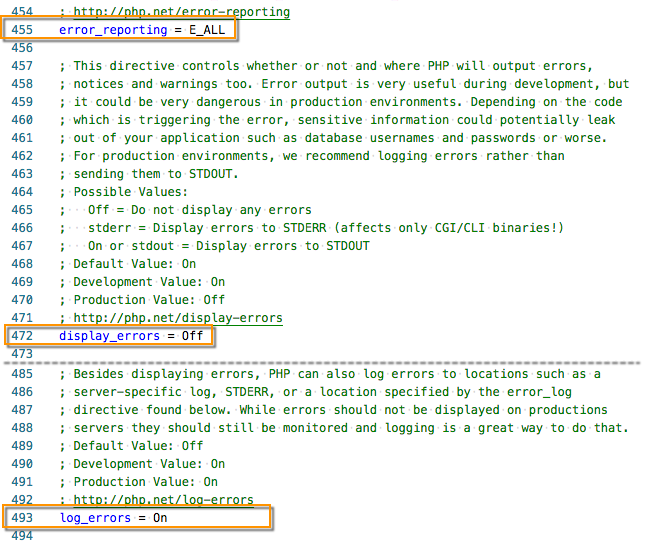 The level of error reporting is set with the error_reporting directive in the php.ini file and defaults to E_ALL. You should most likely leave that default in place. Use phpinfo(). 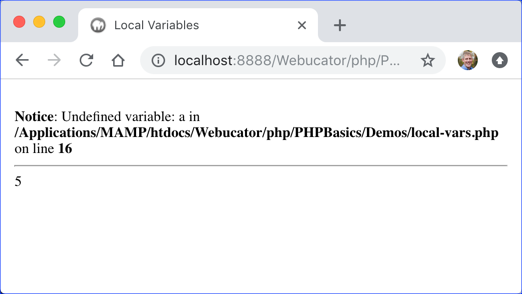 Navigate to http://localhost:8888/Webucator/php/PHPBasics/Demos/phpinfo.php and search for the names of the directives: Remember that this file simply calls the phpinfo() function. Within the php.ini file, you can turn boolean directives on using 1, On, True or Yes. You can turn them off using 0, Off, False or No. In this exercise, you will turn on the display_errors setting whenever the site is not running on the production server. In PHPBasics/Exercises/phppoetry.com/includes, create a new file called utilities.php. You will keep useful user-defined functions in this file. The isProduction() function will provide a mechanism for the code to know if it is running on a development or production server. You will use the isDebugMode() function now. Note that eventually you might have a more nuanced way of setting debug mode. For example, you might give superadmin users a way of turning on debug mode in their settings in an admin section of the website. Open PHPBasics/Exercises/phppoetry.com/includes/header.php in your editor. Add code to include utilities.php once. Note that it's possible we will want to include the utilities.php file on pages that may or may not include the header.php. On such pages, we want to make sure that we don't include the file twice. This code uses ini_set() to turn on the display_errors setting, but only when in debug mode. Navigate to http://localhost:8888/Webucator/php/PHPBasics/Exercises/phppoetry.com/index.php in your browser. Setting display_errors to 1 during development allows us to catch these errors, so that we can improve our code. 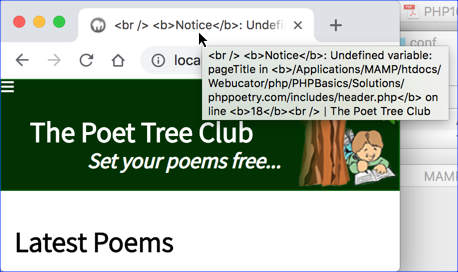 In the next lesson, we will learn how to fix this error, so that on our home page, we do not try to prepend anything to the site name (i.e., "The Poet Tree Club"). If included files are under the web root, they can be accessed just as any other file can. If they have an extension such as inc then the browser may display them as plain text. 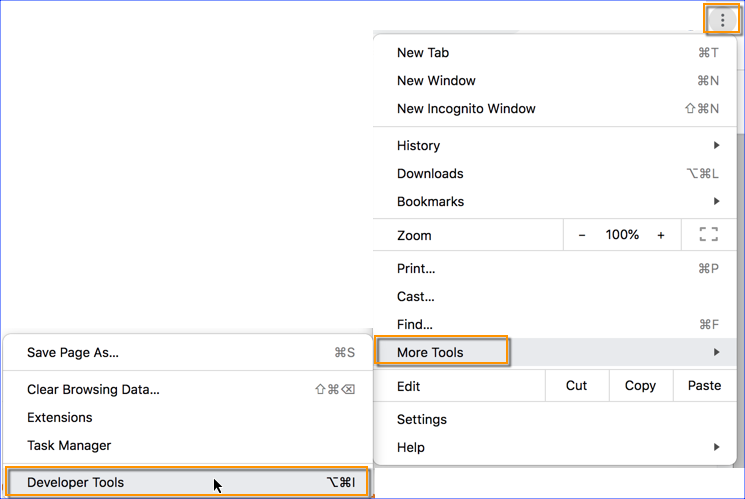 With other extensions, the browser may attempt to download the file. If the included file is a PHP file and a user navigates to it, the server will try to process the file and may return errors. 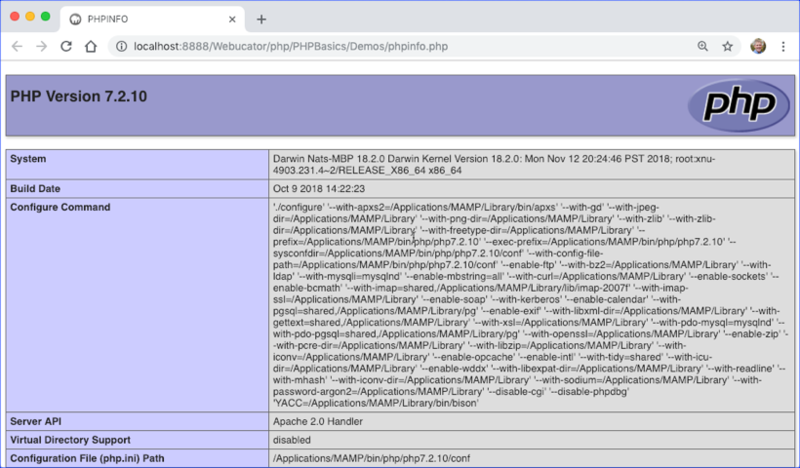 It is also possible that your web server becomes misconfigured and returns a PHP file as plain text showing your sensitive data in the browser. As a precaution, you should place any included files with sensitive data in a directory outside of the web root. This will prevent users from accessing the files directly. In order to be able to include files that are outside of the web root, you will need to modify the include_path directive in the php.ini file. The include_path directive takes a list of paths to directories in which PHP should look for included files. 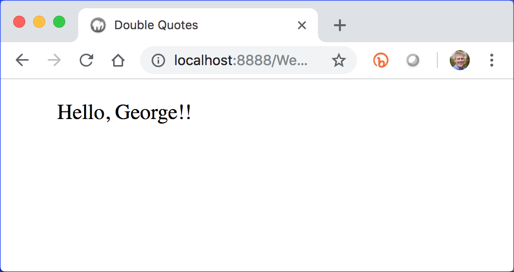 In the following exercise, you will change your setup to be able to include a configuration file outside of your web root. Create an includes directory outside of the web root and place a configuration file in that directory. Modify the include_path directive in the php.ini file. Run a test to make sure you can include the configuration file in the new includes directory. Open the php.ini file in your editor. Remember that you can find out where it is by navigating to http://localhost:8888/Webucator/php/PHPBasics/Demos/find-php.ini.php. 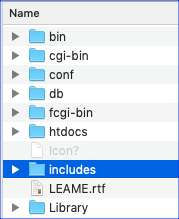 In the php.ini file, find the include_path directive and append a colon (Mac) or semi-colon (Windows) followed by the path to the new includes folder to the end. Also, be sure to uncomment the line by removing the leading semi-colon. After making the change above, save the php.ini file. Stop and start the MAMP Servers. This is required as the php.ini settings are loaded when PHP first starts up. There is no solution file for this exercise as it relates to your computer setup. It's important for future lessons that you have this working correctly, so make sure it does before moving on.